Situated on the grounds of the Collegalli Estate in Montaione, the origins of Villa Strozzi date back to the 12th century. With its 19th century interior décor and its large rooms, the villa certainly captures the essence of Tuscan aristocratic country life. Owned by the delightful Franca Burgisser and run alongside her three daughters, you will be assured of the best attention at all times and most importantly, the advice and care of a family for whom the estate and the surrounding area is a passion.The villa accommodation consists of 5 bedrooms and 4 bathrooms. The drawing room piano will delight those wishing to have a tinkle on the ivories, while others may prefer to take advantage of the billiard room or the peace and tranquillity of the nearby chapel. 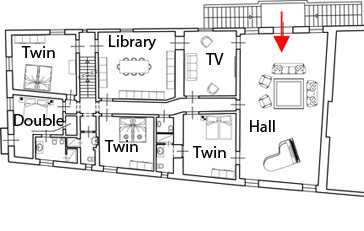 The 2-bedroom annex is made up of 2 doubles or twins (as per your request). One bedroom has an en-suite bathroom, the other bedrooms has a WC and a wash-basin. 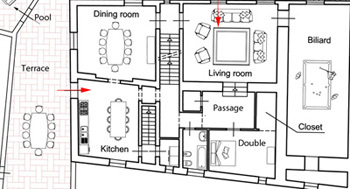 The rooms share a living room and a small kitchen where breakfast can be prepared. Visitors can also enjoy the local wildlife including boars and hares for the more adventurous, while those looking for a relaxing escape can enjoy a dip in the pool, which is situated close to a sun terrace where lemon trees offer shade from the Summer sun. Whether your holiday is one of pool dipping, sun bathing and wine sipping or you want culture, local markets, glorious countryside and day trekking – you have found the villa of your dreams. Luckily, reality is just a click away. Pool 8 x 4 m.
The Collegalli Estate lies in the hills half way between Florence and Pisa, not far from the town of San Miniato, known for its white truffle and exciting the truffel market held each year in November and December. The estate is approached by a beautiful country road. With each bend the modern world fades out a little more and then, all of a sudden, on the other side of a small valley, you see the villa, a rectangular, elegant building, set above a dramatic abyss. Originally the site of a castle built by Count Ranieri in 1123, the estate has since passed through many hands and was given its current appearance more than a 100 years ago. Now owned by Franca Burgisser, who with the help of her three daughters, welcomes guests with a warm and friendly smile. The Estate is well known locally for its pheasant farming and shoots, incredible extra virgin olive oil and its summer crops of wheat, maize and sunflowers. However, it is the building and its surroundings which bring guests back year after year. The interior has been restored to its 19th century glory. But perhaps it is simply the atmosphere which holds the most promise at Collegalli Estate. This is a lovely example of a place where time has stood still – where life moves at a slower pace and where one can leave the cares of the world behind. What could be waiting for you? Zurück vom Urlaub, teile ich Ihnen mit, dass das und auch die Betreuung perfekt funktioniert haben. Es war ein sehr angenehmer Aufenthalt. Ich möchte und kann diese Villa weiterempfehlen. Collegalli lies half way between Florence and Pisa. The next village is Corazzano 5 kms away (15 min).